Move-in condition … everything stays !! Source: Large condo with ocean view from every room … This large condo offer you a fantastic view of the ocean from every room and only steps to the beach … located in a nice gated community of Sosua close to town where you will find lots of restaurants, shops, grocery store etc … the complex is quiet and very private … situated on the ground floor, corner unit with lots of lights from the windows … fully furnished with style, air condition in living area and bedroom, the kitchen is well equipped with dishwasher, microwave, stove and refrigerator … washer and dryer, open space living area with beautiful coralina wall equipped with sofa-bed … large swimming pool with Jacuzzi … parking space … just move in and enjoy the view !!!! Located in the heart of Cap Cana marina, these villas offer views across the marina as well as benefitting from their own boat slips suitable for yachts up to 60ft. The 2 story villas have spacious bedrooms and well sized social areas with double sized ceilings giving a nice sensation of space. An elegant entrance, pool and roof top Jacuzzi finish this exclusive package.Contemporary style kitchen cabinetry with marble and granite topsCentral air-conditionedHigh quality kitchen appliancesLaundry room and storage together with maids quartersOpen terrace and gazeboInfinity pool & JacuzziThree bedrooms with private bathrooms with walk in closets and exterior showersParking space for 2 cars and golfcartPrivate entrance to Cap Cana MarinaLocated within the 30,000 acre resort of Cap Cana and only minutes away from the airport, there is more than plenty of activities to keep you occupied. As well as the on-site Jack Nicklaus golf course, the surrounding area features many more courses for the keen golfer with designs by PB Dye & Tom Fazio to name but a few. Additional on-site resort facilities include over 3 miles of pristine coastline, marina, ecological park, equestrian facilities and numerous restaurants. If your plans are to live here full time with your children, Cap Cana also offers a private school , which is recognized by the Ministry of Education and accredited by Ed/SACA.For pricing and more details on this property, contact us now. This stunning villa is located in one of the newest ocean front communities in Punta Cana, within the grounds of Arrecife gated community development. This resort style residential development is surrounded by P.B. Dye’s first inland golf course in the Dominican Republic.The 5 bedroom beachfront villa sits in a privileged position with having both ocean views and views across the golf course. The property sits on just over a home lot of just over an acre and 2 master suites which overlook the ocean as does the family room and the gallery. The villa has been finished to the highest standard.La Cana golf course designed by P.B. DyeCorales golf course designed by Tom FazioChoice of 9 restaurantsOn-site facilities such as tennis, kite-surfing, scuba diving, snorkeling, water skiing, deep sea fishing, ecological walks and much morePunta Cana International schoolChoice of stores, banks, supermarkets, ice-cream parlors, pizzeria minutes away in Punta Cana village15,000 acre siteVIP service at Punta Cana International airportMembership at La Cana Golf & ResortsChoice of stores, banks, supermarkets, ice-cream parlors, pizzeria minutes away in Punta Cana villageOther Caribbean villas within the Arrecife neighborhood range from a third of an acre to over one and a half acres in size. 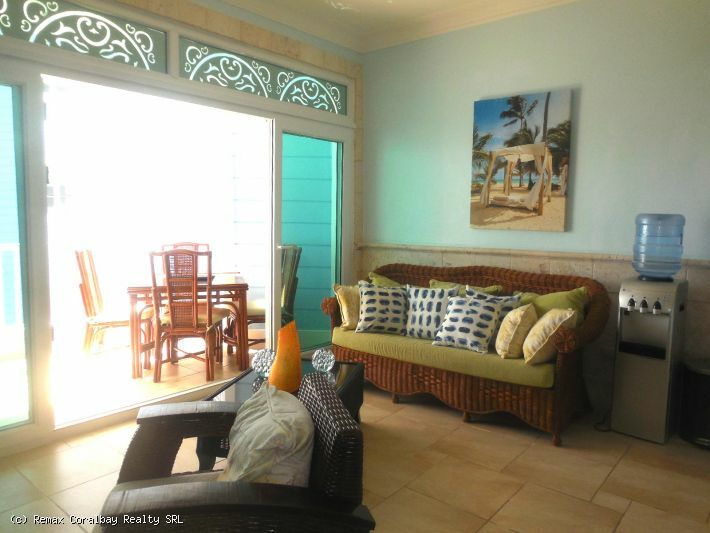 All homes are also conveniently situated near the pool, beach, and restaurants of La Cana Golf & Beach Club. This is your chance to own a piece of Dominican real estate! Contact us for more options available within this development. This luxury and charming ocean front villa is located in one of the best residential areas of Sosua… It is perfect as family villa or rental project… on the main level, you will find a large open plan living and dining area that opens to a large terrace to the pool and ocean, fully equipped kitchen with breakfast room, 3 guest bedrooms, 2 full bathrooms, one half bath and TV lounge room …on the top level are two large en-suite master bedrooms with balcony and great view of the ocean, a large sitting area and extra office/bedroom … the basement which can be access from the 2 car garage with private entrance is completely finished with billiard room, TV projector room and 2 guest bedrooms with en-suite….. This villa is fully furnished, nice swimming pool, beautiful grounds with tropical trees …. via Luxury 7 bedroom Ocean Front Villa,.